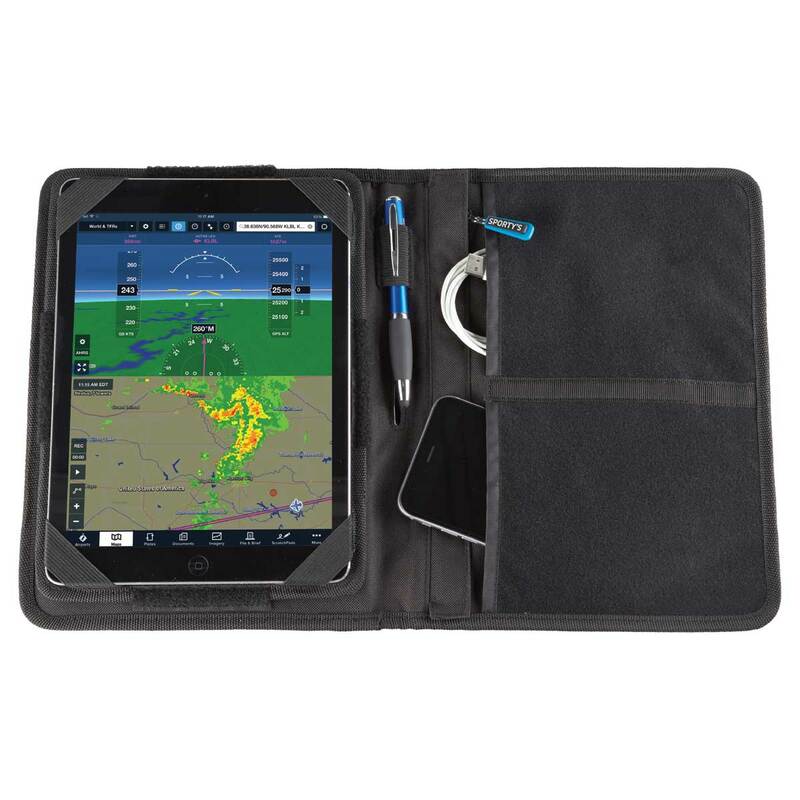 We are constantly looking for ways to improve our existing products, and that includes this best-selling tablet kneeboard. Customer feedback, real world tests, and improvements in technology have led to this new and improved design. 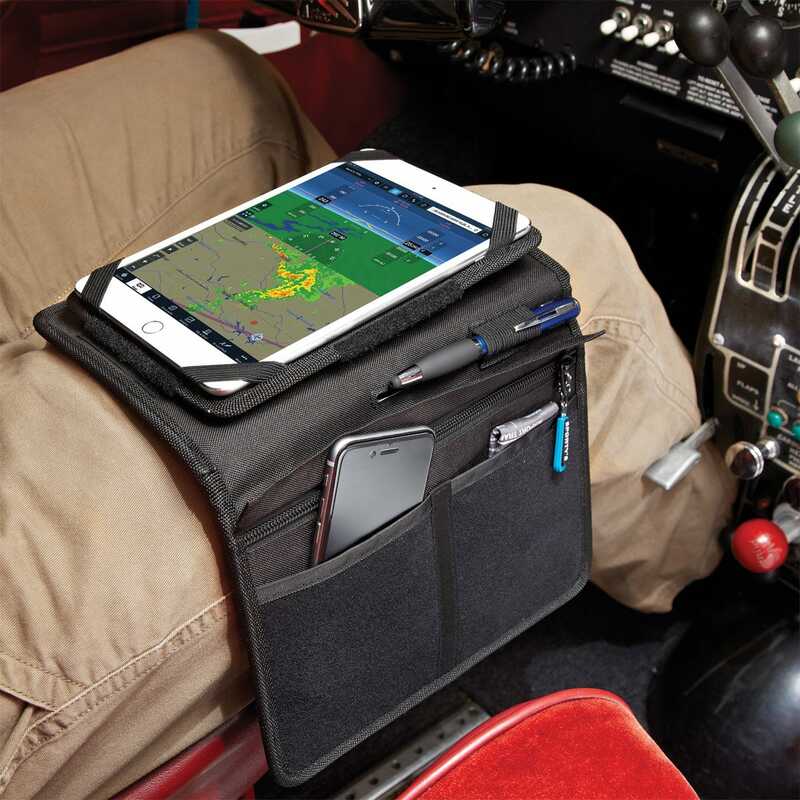 The Flight Gear HP iPad Kneeboard holds the iPad right where you need it - secure on your leg but easily within reach. An integrated kickstand means you can tilt the iPad towards you, which helps to reduce glare. A simple hook-and-loop rotation mechanism allows for portrait or landscape viewing. 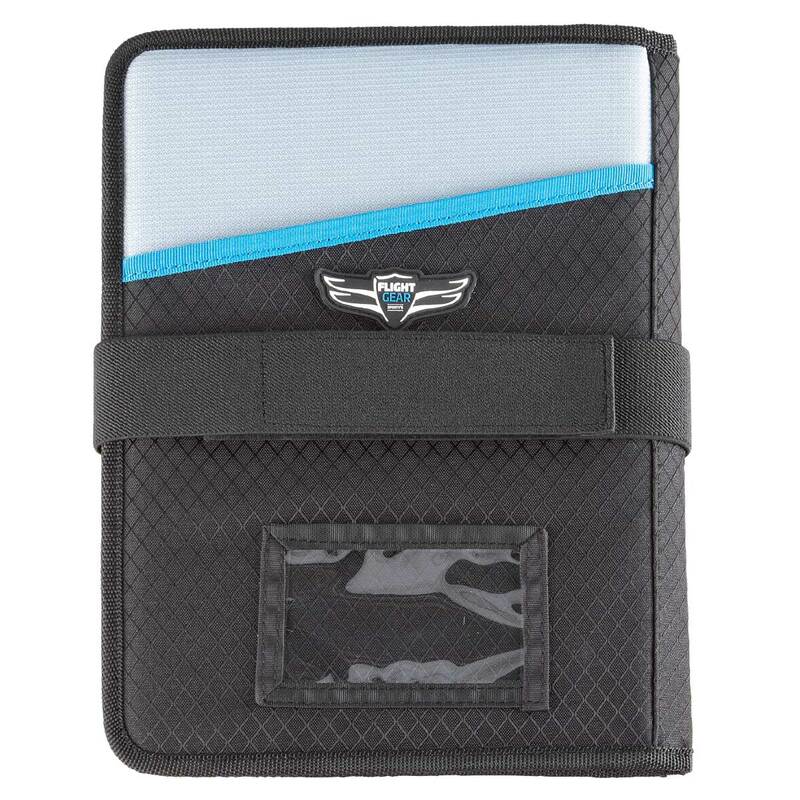 The side flap is covered with soft material for attaching any of Sporty’s Flight Gear HP Gear Mods. Choose from two models: iPad Mini (fits versions 1-5), or full size iPad (Air 1-2, Pro 9.7", iPad 2017, Pro 10.5" and iPad Air 2019). There are quite a few models—find yours with our handy chart. I got in the left seat the first few times and my iPad slid out of my lap and onto the floor. I was fumbling around to make good use of it while operating the aircraft and was mortified in front of my CFI for being so unprepared. This thing holds my iPad Pro 9.7” right where I need it without sliding around and has some convenient storage. 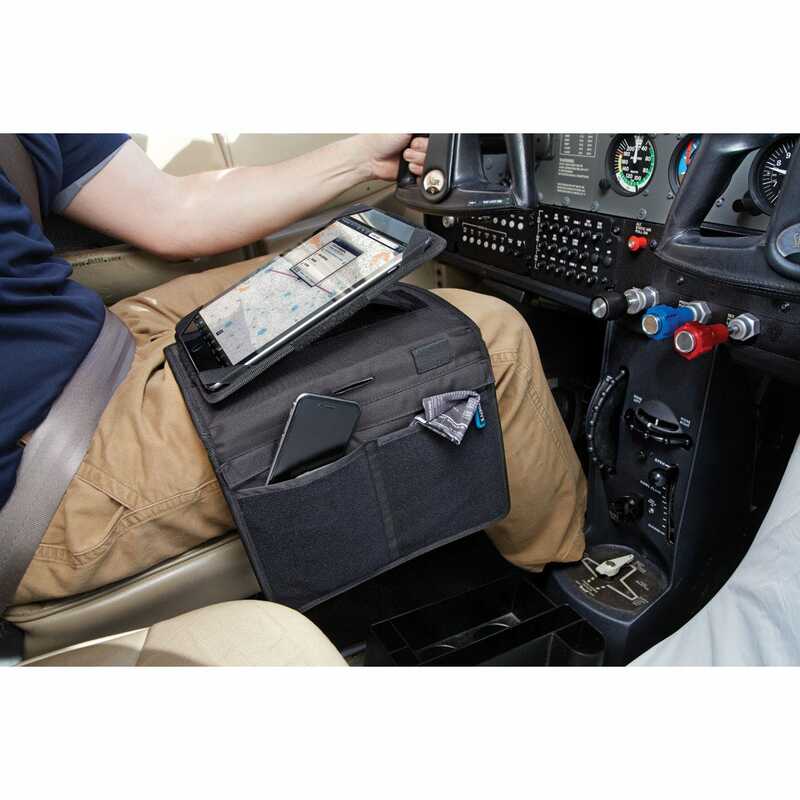 The pockets are a little tight and retrieving things from them in flight can be tricky. I use the adjustable stand at home to watch videos and read but have not used it in the cockpit yet. 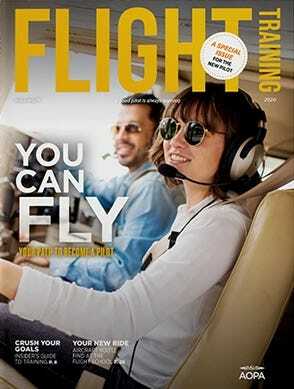 I reckon when I no longer have my CFI in the right seat to point me in the right direction, I’ll get more use of it. The padding on the back keeps things comfortable while remaining light and portable outside the cockpit. 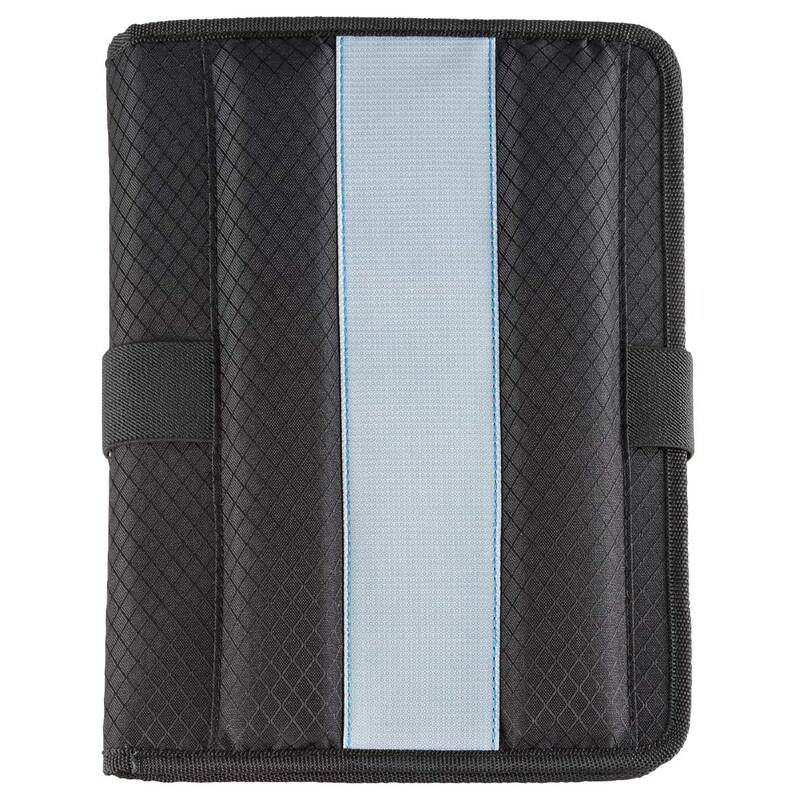 The Velcro straps pass through the case to allow you to hold the cover in place behind the iPad when not strapped to your knee and the pen holder is very handy. If you have an Apple Pencil or a pen with a stylus pad on the back, you’ll enjoy that it’s there. I worry about the Velcro holding up over time, and don’t like that the power and volume buttons on the 2017 model are covered by the elastic corner straps, but my experience overall has been very positive thus far! I find it to be a bit bulky. If I fold the side pouch under and strap it on as just an I pad holder, it is quite thick, about an inch. However, most of the ones that I looked at are much the same. The quality of manufacture is good. Looks nice, functions well for a lower priced iPad kneeboard. The only thing I would have changed is adding a Velcro strap to keep the cover closed when not in use. The strap block several important areas of the I-pad and the board holding the i-Pad detaches a little to easily from the rest of the unit. Its holds my iPad mini very well, I like the option to tilt it up on a angle. Glad I got it , inexpensive too. Nice to have proper equipment to fly with even better when you aren't scrambling around under and in between seats when it falls off your lap in flight. Bzzzzzz Bzzzzzz Bzzzzzz ! Mayhem when that happens, Right? On my lap secure and wear I need it be! PPE = Properly Placed Equipment! LOL Plus a place for your Pen and Notepad! Us new pilots now a day have it so good! I imagine truck drivers might gain from using a knee pad. Very good value. Very functional. I use it with a 10" Android to run Avare. -Except for my headset and reading glasses, it can carry everything I need for flight. - The upper right strap presses the button on my tablet. So far the tablet stays snug without that one strap. This is only a problem for my specific tablet and would not affect an iPad. - The pockets shown are only usable while the cover is in the open position. Otherwise, whatever is in the pocket will press against the tablet screen and that is not good. So, paper and very thin or soft items only, or, if you need thicker items (phones, etc), take them out before closing the flap. - There is a large outside pocket on the front when the flap is closed. I slid my old knee pad clipboard into that pocket which is handy if you need a writing surface or a place to keep backup printed charts and plates as well as paper to write on. I can just flip it closed to use the clipboard. - There is a small slit in the fold between the two halves. You can pass the leg strap through it if you only plan to use the tablet half and don't want the other half hanging off your leg. - The tablet can be rotated if it is in the way of the yoke or you just prefer a different angle. - The tablet can be tilted up for different viewing angles. Fits perfectly, no movement. I have an iPad mini 4 and this was the perfect kneeboard. The fact that I can prop it up is an extra perk and good for reducing glare. You might have to move the straps a small bit to see the very ends of the corners of the screen, but it's really a non-problem since most everything is free and easy to access. What size iPad with this accommodate? BEST ANSWER: There are two options - one for the iPad Mini size (1-4), and one for iPad Air 1-2/iPad Pro 9.7". It’s for the 9.7 and 10.5 screen their physical dimensions are the same. Will this case hold the IPad Pro 10.5"? There are two similar questions that appear to conflict. BEST ANSWER: Yes it will hold the 10.5 iPad. Will this secure the iPad during aerobatics? 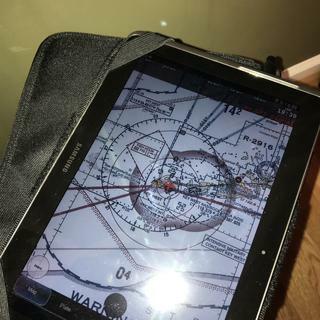 I'm looking for a sturdy iPad kneeboard that isn't bulky, will hold things in place during aerobatics, and won't pop off when my g-suit inflates. BEST ANSWER: I have this knee-board and I love it! But ... I would not trust it in aerobatics. The Velcro just holds the bottom of the iPad in place to keep it from sliding around during normal operations. After having this for a week, I am certain your iPad would fly right off in high G situations. It's quite sturdy. The iPad won't be going anywhere even during hi-G turns. The only issue for me is that the whole thing is quite bulky. I ended up swapping it out for the MyGoFlight kneeboard. Agreed, to be secure in anything other then s & l it needs more Velcro. Is it possible to rotate this to wear on the left leg? BEST ANSWER: Yes it is possible to rotate this to use on the left leg. BEST ANSWER: The Ipad kneeboard allows for the iPad to be shown in both portrait and landscape mode. They did not explained btw these 2-different products. The are for different size iPad. Basically the same. How come the availability says “in-stock” on the product description page, but when I add it to my cart, it says it’s out of stock? Is this product actually available? BEST ANSWER: This product is currently out of stock. We expect to ship on June 15th. Is it can use for ipad 9.7 2018? BEST ANSWER: Yes, there is an option for the 9.7 iPad. Is there a Clipboard clip on top of front top of outside cover for holding paper? BEST ANSWER: There is not a clip on the top to hold papers. Will this product work with a Samsung tablet of the same size as the mini? BEST ANSWER: Yes it will fit the Samsung Tablet. The clips that hold the edges of the tablet are able to expand. Will it fit an ipad pro 2018 11-inch? BEST ANSWER: The iPad will fit, it is tight, the elastic bands cover part of the screen. Will it fit an iPad it's an otter box on it? BEST ANSWER: No, an Otterbox is going to be just a little too thick. No, this model does not include a clipboard. No. Just the kneeboard with iPad holder. I know it states what iPads it holds, but can it also fit older model iPads? BEST ANSWER: The biggest factor is the screen size. I just got my new knee-board a few days ago and love it. 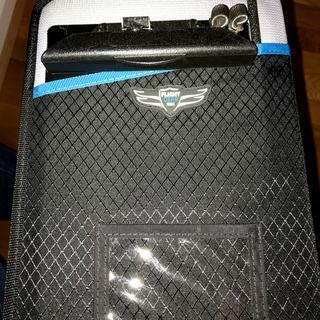 It has elastic straps that hold the iPad in place. So it is not like some hard case mounts that are ultra specific. My iPad is a 9.7" screen, but is 11" exactly from corner to corner. If your iPad (or other tablet, for that matter) measures around that, you should be good to go with this knee-board. OH! And it is comfortable, too! My only wish is that they had another Velcro strap at the top, too, for extra hold when i have the knee-board flat, as in my aircraft I actually prefer NOT to prop it up. I have an IPad Mini 4 and it fits great - I can't see why it wouldn't fit an older model. It's just held on with an elastic strap which gives it some flexibility in sizing. Older and thereby “thicker” should work. The rubber bands offer enough flex. I see questions about the straps blocking the corners of the iPad. Is it possible to cut a slight notch and still keep the iPad secure to the knee board? tension strength or possibly cause it to become unraveled. 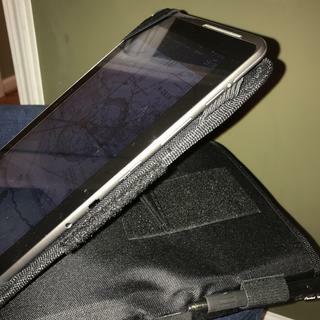 If the strap obstructs viewing presentation that is in the corner of the ipad or tablet, you may want to try wrapping thread , string, or a narrow piece of tape around the elastic to make the strap more narrow. That would still preserve the strength of strap and possibly improve the view. Good luck. The straps don't really block any functions of the iPad. The power button is still accessible, even with the straps on, as is the volume reducing button. The only button blocked by the strap is the volume increasing button and you can actually still make it function by pressing on the strap. Will it hold the iPad Pro 10.5" ? BEST ANSWER: This WILL fit the pro 10.5”. This will not fit the 12” pro. This will not hold the iPad Pro. Will it work with the Apple Smart case? 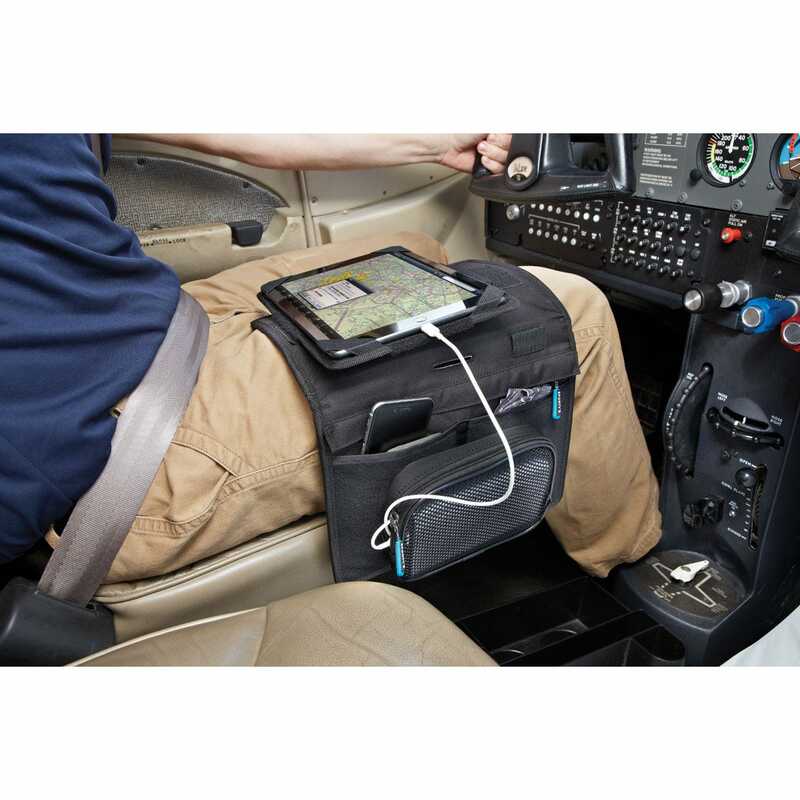 BEST ANSWER: The elastic straps that secure the iPad to the kneeboard have enough elasticity to stretch over the iPad while in a smart case. However, doing this will add bulk to an already less than slim case. I have the 9.7" iPad Pro with the Apple Smart Keyboard and it fits. Will this case hold the IPad Pro 11"? BEST ANSWER: It will fit but the elastic bands cover the corners of the iPad. I would not recommend this product for the iPad 11. How does this get secured to the leg? Good morning. Do you sell your products to Spain? BEST ANSWER: Yes we ship worldwide. Will an iPad Mini, mounted in a Pivot protective case, fit in the corner elastic straps? BEST ANSWER: It should fit. If it does not you can return the kneeboard. It will not fit to 10.5 iPad pro? BEST ANSWER: Yes it will fit the 10.5. Does this come with the pouch included in picture 2/16 to hold a charger? BEST ANSWER: The pouch is an available option. Can you put your license in the front? BEST ANSWER: It does not have a place to put the your license in the front. Does this have leg straps or does it simply sit on your leg? BEST ANSWER: The knee board has leg straps that attach around your leg with velco. my I-pad is 5.25 x 8. will this fit??? 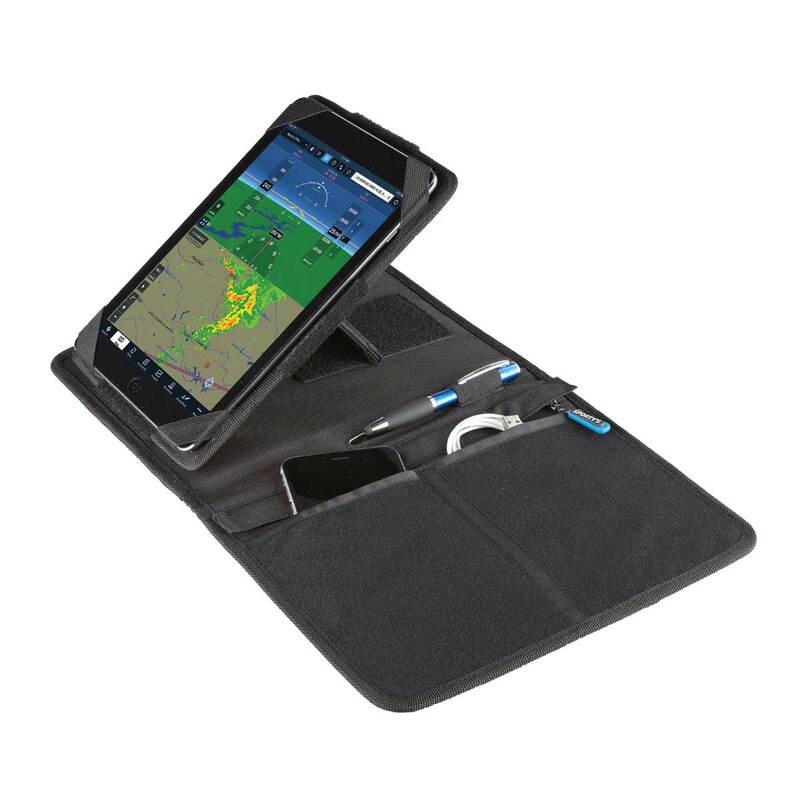 Does this kneeboard have a tilt function so you can elevate screen for a better view? BEST ANSWER: Yes it does. It tilts and rotates. Which option /size would work for a Samsung - Galaxy Tab E - 9.6"? 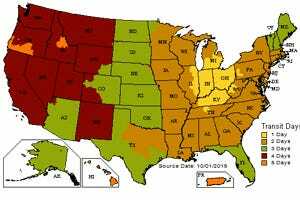 BEST ANSWER: This product accommodates a large variation in size. My 9.7 inch iPad is OK. Does it rotate from portrait to landscape, or is it Velcro? BEST ANSWER: It is velcro, so you can switch from one to the other quickly. What are the measurements of the knee board? BEST ANSWER: The Mini is 7"w x 9.5"h; the Air/Pro model is 8.5"w x 11"h.
I am a helicopter pilot and want to use this on the left leg as I rest my right arm for the cyclic. Can I simply flip it "upside down" so I can use it on my left leg? BEST ANSWER: Yes you can - works very well in that position.